Everyone says they want it… yet few of people have a solid plan to get it. And those who do have a plan often fail to execute on it day in and day out. So how do you stay focused on the most important things each day so you make consistent and predictable progress? I’m a fan of using a daily success checklist. Do not confuse this with your to do list… you know that endless catalog of things you drag around that makes you feel guilty about not being more productive. Your to do list is helpful for remembering all the tasks you think you want to do. But it will more often kill your motivation and sabotage your long-term success instead of helping you achieve meaningful results. That’s where a simple daily success checklist comes in. This one-page tool will keep your subconscious brain attuned to the most critical thoughts that enable your business to grow by quickly and more easily. A good daily checklist encompasses three time frames: future, present and past. Here are the key items to put in each time frame. By reminding yourself of the future state in which you wish to live, you create focus your subconscious brain. When your subconscious is focused, it acts as a filter that weeds out the unnecessary distractions in your day. It helps you make decisions in the present that will lead you faster and more easily to your ultimate vision. There are three future-state items to remind yourself of each day. The first is your vision. Take a minute to read your vision of your company and program your subconscious to find ways to make it happen. Next, spend a few seconds reviewing your annual goals. Remind yourself what you are working to accomplish this year so you can align your day with accomplishing it. Finally, review your key areas of focus so you can ensure that whatever you decide to work on today is part of a larger project you want to achieve. This future-state review will take just two minutes but it will silently run in the background all day long, aligning your decision-making in the direction of your biggest dreams and desires. 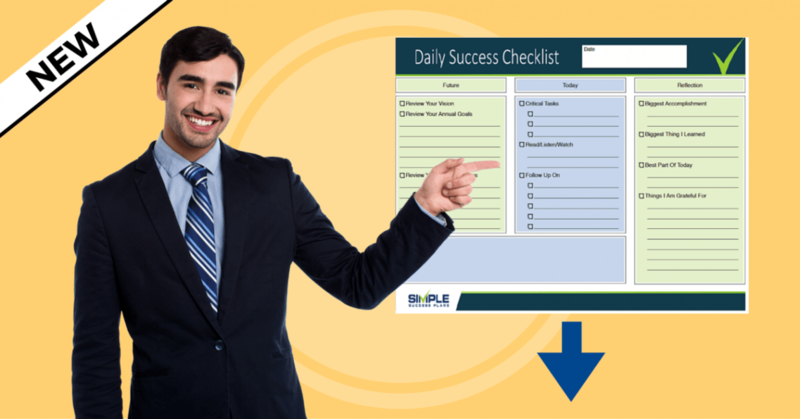 Download the one-page daily success checklist we use with our clients. This is the list of actions you are going to take today. The secret here is to NOT overload yourself with endless tasks but rather to prioritize your list so you are focusing on the 20% of actions that will yield an 80% increase in results. Many studies have been shown that focusing on no more than three critical tasks each day can have a powerful effect on outcomes. Choose the three most important tasks to accomplish and do them first. Touch no other chores until these three items are checked off. It can be tough to do when you first get started, as you are likely in the habit of being distracted by email, etc. However, when you master this one practice you will see your profitability explode. Another crucial daily habit for success is reading (or listening to) educational or inspirational books. Choose one chapter, article, or training module to read each day and you will see an almost immediate increase in your results. Finally, for the present, it is important to follow up on things you delegated, outsourced or are waiting for a response on. Whether it is a task you gave to someone else or a sales prospect that needs a reminder, make a short list of the most important people for you to follow up with today. This little habit will keep things from falling through the cracks for you. After just a few days of practice, you will find you can accomplish this part of your planning in just two minutes. As a business owner, it is very easy to get excited about future growth and caught up in present activities. While these are helpful for your growth, when not balanced with reflection on past progress, they can lead to stress and burnout. Each day take a moment to revisit the best of the day including what you accomplished and what you learned. Then take a minute to remind yourself of the things you are grateful for in your life. When you are striving so hard to grow, it is common to feel disappointed by things you don’t yet have. When you pause to reflect on what you already have, you calm the stress chemicals in your body and clear your mind to see new and powerful opportunities. The simple act of creating a daily checklist focusing on your future desired state, your critical tasks for today and your reflections on your success will take you just five minutes. Imagine starting each day with a clear direction, deep motivation and solid plan. Imagine ending each day with a sense of accomplishment, completion and gratitude. Create your own daily checklist or download our version here. The results you see from using it will blow you away.